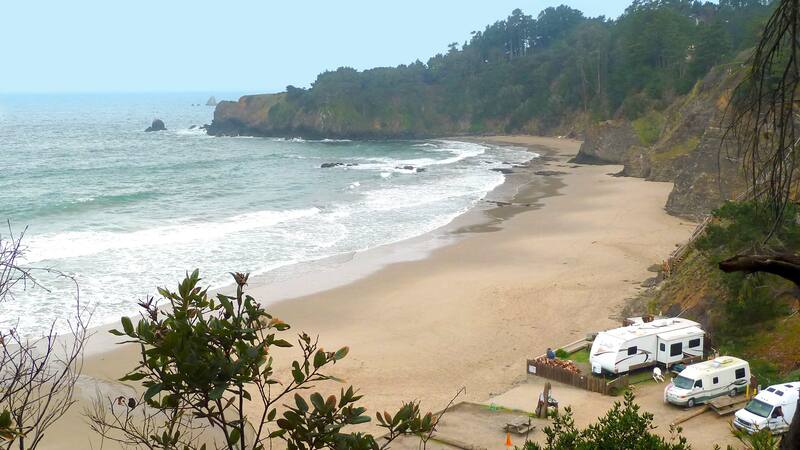 A small, six-acre, privately-owned campground located along Mendocino County’s scenic Highway One, fronting right on the Pacific Ocean. It lies in a narrow gulch filled with native redwood trees, ferns, and other coastal flora, and opens onto 1/2-mile-long Anchor Bay Beach. We are about 3 hours driving time by car from San Francisco. The campground is very popular and is often filled to capacity during the On Season‘s weekends, holidays, and school vacations. But it is always a quiet, peaceful, family-oriented place because most of our customers have made Anchor Bay their favorite destination, returning with their friends and relatives year after year. We’ve seen their kids grow up, and now their kids are coming with their own children. Having a close-knit and respectful clientele assures a warm, relaxed, and friendly stay for all comers. 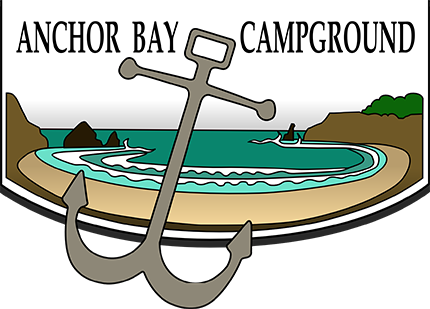 Anchor Bay Campground is very popular for fishermen, beach combers, divers, and sea kayakers. The outdoor enthusiast will find so many wonderful opportunities at this beautiful location. Things To Do! We have 27 overnight camping spots (4 in the redwoods and 23 at or on the beach) and 40 owned spots (See Map). Each camp spot has a water hook up, picnic table and fire pit. For those sites with electricity or sewer dump, please refer to our Rate Sheet On our rate sheet we have also included information as to the largest size rig allowed in each spot. Our restrooms have showers (coin-op), flush toilets, hot water, and electrical outlets. Our campground also has a septic dump station, recreation area with sink and picnic tables. Often times you will visit our fish cleaning house, and see some of the local catch of the day being processed! We sell ice, bait, firewood and apparel. For reservations, please visit our Reservation page. On the bluff top above the beach, connected by a short trail from the campground, the little resort village of Anchor Bay provides most of our camper’s needs. The Anchor Bay Store is an organic based grocery store, White Cap is a locals favorite for coffee and pastries, and restaurants include both a Thai restaurant and a Mexican restaurant. There is a coin op laundry mat, yoga studio, hair salon, and a massage therapist.